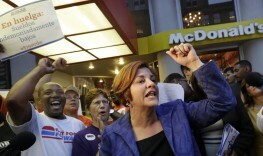 Christine Quinn speaks at protest at McDonald’s in New York. Movement calls for $15 minimum wage for fast-food workers. Image from NPR.com. Over the past year, we’ve seen numerous protests and walk-outs across the nation as fast food workers campaign for higher wages. These aren’t high-schoolers working their first jobs either, they are adult providers and often the only income in the household. But the problem of low wages isn’t just affecting the workers and their families; about 52% of fast-food workers are enrolled in at least one public assistance program such as SNAP (food stamps) Medicaid or the Children’s Health Insurance Program (CHIP), which is costing taxpayers $7 billion in public assistance. According to a recent study “Fast good, poverty wages: The public cost of low-wage jobs in the fast-food industry,” three-quarters of American’s who enroll for public benefits are working, many of them within the food industry. Median pay for a fast food worker is about $8.69 per hour. And when you factor in the part-time hours and lack of benefits, the wage is hardly enough to put value meals on the table, let alone pay all of the bills associated with running a home. The overwhelming majority of people working in the fast-food industry are adults who support themselves, not teenagers. And an estimated 68% are the main wage-earners in the family. One quarter work at a fast-food joint to help support children. A huge gap between the amount of money brought home from a fast-food job and the amount of money needed to run a household is troubling and has led to $3.9 billion each year in Medicaid and Children’s Health Insurance Program (CHIP) benefits, $1 billion for food stamps, and $1.95 for the earned income tax credit. Workers and the agencies who support their cause are campaigning for higher wages throughout the country. Specifically, they want to see fast food workers—who many people depend on for their morning, noon-time, and evening unhealthy meals—make closer to $15 an hour, at least enough to feed their own families. Critics say raising wages won’t have the desired effects, and won’t save taxpayers anything. As companies are forced to pay workers more, they’ll make do with fewer workers so as not to hurt their profit margin (after all, lining the pockets of giant corporations like McDonald’s is why wages are so low in the first place). And by cutting workers, more unemployed will be forced to turn to public assistance. A larger piece of the puzzle that many people seem to be missing is that the fast food industry is not built to pay high wages; there is nothing about this industry that says things should be equitable or fair. It is designed to churn out low-cost food-like products at warp speed and with minimal production costs. If production costs more, the companies may have to charge more for their products. If the “value meals” cost more, the people might actually start demanding better food and higher quality ingredients for their money. What was the “fast food” industry then turns into the restaurant industry and we all know these companies aren’t running operations reputable enough to call a restaurant. Even full-time hours are not enough to compensate for low wages. The families of more than half of the fast-food workers employed 40 or more hours per week are enrolled in public assistance programs. The solution is less than clear, but judging by the quality of food fast food restaurants offer, it is likely that a substantial increase in wage won’t be on the books – not without force, anyway. Fast food jobs were never meant to be long term, high paying jobs. The real issue here is that the federal government has created and continues to promote the double whammy of severe inflation through devaluation of the dollar which has lost 94% of its value, and the shifting of hundreds of thousands manufacturing jobs offshore, mostly to China to benefit Wall Street. The inflation process was started when Wilson illegally signed the no-Federal, no-Reserves Act in 1913. This has everthing to do with the ruling class of Congressinal criminals (Democrans and Republicrats)……they’re both equally responsible as they answer not to you or me, but to the international Banksters who control everything. A democran (Clinton) set the great Bankster Ripoff in motion by signing the repeal of the Glass-Steagal Act in the mid-90’s, which created the stock market and housing bubble, and now the multi-trillion dollar derivatives bubble which will someday pop and accelerate a massive depression that will be worldwide. The democran-based Unaffordable, Uncaring Act will impoverish more fast good workers (and millions of other working Americans) by limiting their working hours to <30 hours/week. Of course, that is exactly what the government wants, the creation of MORE people dependent on government benefits, who will idiotically and predictably vote for the same politicians who put them in their dependent slave position. Nothing will change until the entire debt-based fiat monetary system collapses, which will lead to death and destruction on a massive scale, which is exactly what the 12 banking families that rule 3/5 of the world want. It's all spelled on the Georgia Guidestones in plain sight. Don’t you think that is an outrageously simplified response? banks and so many more out of the picture, you’d have a more generous society.